Q. How do I access my reading lists? Log in with your University ID and password. Your reading list is in a section called Library, under the heading Full Reading List (screenshot below). Some reading lists include resources recommended for you to purchase. Click ‘To Buy’ to see what these resources are. 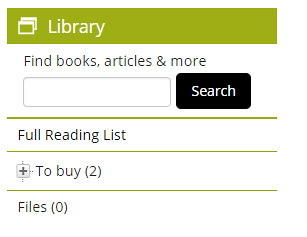 Use the 'Find, books articles & more search' box, to discover more resources to use in your studies. This box does not search your reading list. You can browse all reading lists here, although Moodle is the best way to access the resources for the units you study. Please contact your tutor if your Moodle area does not have a reading list section.